The Isle of Jura travel guide in Inner Hebrides gives information on and around the place. The guide helps you in how you get to Isle of Jura and getting around the place. Also includes details on hotels and accommodation in and around the place. The words 'wild' and 'remote' tend to get overused in describing the many Hebridean islands, but in the case of Jura they are, if anything, an understatement.One of Scotland's last wildernesses, Jura has one road, one hotel, six sporting estates and 5,000 red deer, which outnumber the 200 people by 25:1, the human population having been cleared to turn the island into a huge deer forest. Rather appropriately, the name Jura derives from the Norse 'dyr-ey', meaning deer island. The short ferry crossing from neighbouring Islay takes you into another world, pervaded by an almost haunting silence. Relentlessly battered by fierce Atlantic winds, the islands can seem a hostile environment and an unappealing proposition,particularly if you happen to be stuck there on a wet Sunday without your own means of transport. Much of the interior is bleak peat bog, rocks and endless tiny lochs and the long struggling crofting communities only add to the feeling of desolution. but there are miles of superb beaches, wild mountain scenery, numerous archeological treasures and long hours of summer day light in whcih to appreciate it all! Jura is best described by the famous words of the novelist George Orwell who stayed on the island at Barnhill during the 1940s, who chose to describe it as an "extremely un-getatable place"!, so in case you are looking to be amidst the last remaining traces of wilderness in Scotland, do not look beyond Jura! The first signs of human civilization on Jura dates back to around 11000-8000BC to the Mesolothic age just after the last ice-age. The early inhabitors of Jura were hunters and gatherers who moved in small groups as per the availability of food resources.Around 2000BC much of the original forest was cleared and made into pastures and agriculture fields. The iron age and early historic period stretched roughly from 750BC to 1000AD and the early historic period started with the kingdom of Dal Riata. 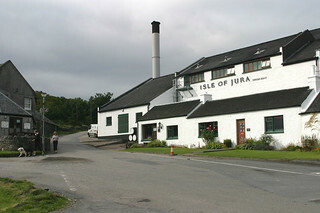 At a much later period, Jura came under the Lords of the Isles that later became the famous Clan Donald.The Lordship of the Isles ended when John MacDonald II's (the 4th Lord) entered into a meaningless treaty with Edward IV of England under which he believed he would become King of all Scotland north of the Clyde/Forth in return for giving allegiance to Edward. It resulted in the fall of Clan Donald, which was replaced by the Campbell Clan in the early 1600s from which 11 lairds ruled the island and lasted till 1938 when the last Laird of Jura, Charles Campbell, sold off the remaining parts of the Jura Estate and houses. A small car and passenger ferry makes the regular 5-min crossing daily from Port Askaig on Islay to Feolin Ferry. The single-track road, the A846, heading from Feolin runs along the island giving most visitors access to as much of the island as is possible by car.For times, contact Cerco Denholm, Tel. 01496 840681. A one-way ticket costs £10 per car and £1.80 per passenger. Most of the island can only be visited on foot.Amazingly enough, there is a bus service on Jura, which runs from Feolin Ferry to Craighouse several times a day, Mon-Sat. A few buses continue to Lagg and Inverlussa and return to Craighouse. Note that some journeys are by request only and must be booked the day before, Tel. 820314. Jura has many historical sites of interest that range from Iron Age Forts to ancient burial grounds and standing stones. the main settlement of the island is a beautiful little village of Craighouse, whcih has a hotel and a tea room apart from Jura's only distillery, which brews the highly acclaimed and award winning Jura single malt, well known for its eclectic flavours. You can start the island tour at Feolin, which is nothing more than an anchoring place for the ferry and the starting point for the only road on Jura. the Ferry House is the only house at Feolin and used to be the house of the ferrymen in earlier days. Jura House, built around 1880 by the Campbells of Jura and include the beautiful walled gardens which sadly are closed to the public. The 12,000-acre Ardfin Estate, which includes Jura House Garden, was bought by London-based Australian hedge fund manager Greg Coffey in November 2010. The tiny islands of Am Fraoch Eilean, famous for the vestiges of the Claig Castle, one of the major sea fortresses that were used by the Lords of the isles to control traffic in the seas. Visiting is tricky as it is inaccessible except for the hardy prepared to swim or kayak across the sound of water to the island. Jura enjoys a mild and pleasant climate all round the year ehich attracts outdoor sports enthusiasts to Jura. A walker's haven , the isle of Jura has many walking trails that offer great views of the wild life and nature. The adrenalin lovers can set out on a climb to the Paps of Jura, visit the Wild west coast with it's amazing wildlife or the Corryvreckan Whirlpool in the north.There are many raised beaches and caves on the west coast trails. Jura is home to many exotic birds and is a bird watcher's delight. Some of the Festivals of Jura includes the annual Fell race that takes place in May. The Fell race is one of the toughest challenges in British hill racing and a true test of grit and endurance. It involves mountaincraft, athleticism and fell running technique. The Jura Music Festival that falls in September is another important event in the festival calender of Jura. into its 17th year, The Jura Musical Festival is quite popular among the lovers of the traditional music scene. Jura has not many luxury or deluxe hotels but you can easily find comfortable places to stay including guest houses, small inns, self catered accommodation facilities and cost effective options like hostels and bed & breakfasts. Outdoor camoing is another cheap accommodation option. As Jura could be teeming with tourists during peak season , so it is recommended to book the rooms in advance.